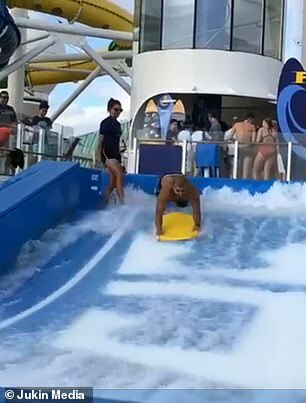 A man trying out a surf ride aboard a cruise ship got one heck of a surprise midway through the experience, much to the crowd’s amusement. 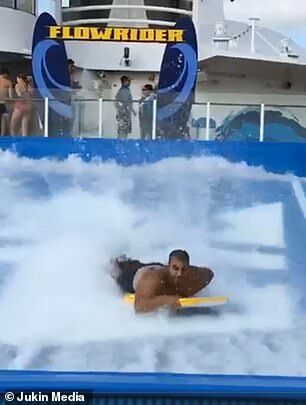 A video recently surfaced showing an unnamed man nearly losing his shorts while riding the artificial wave-generating FlowRider attraction aboard a Royal Caribbean cruise ship. 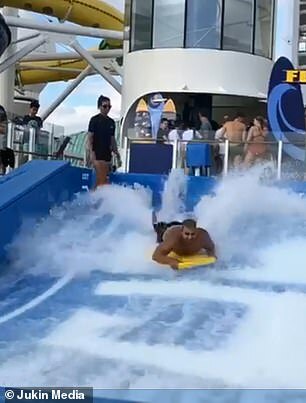 The video starts with the man — wearing modest, below-the-knee black shorts — clutching a yellow body board, getting some last minute instructions from the ride operator. 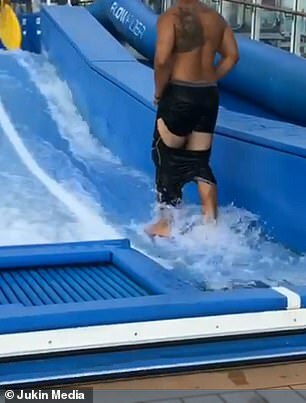 He then drops down into the rushing water and appears to be having a swell time, until he realizes that things have gone pear-shaped as the pressure of the waves causes his shorts — and undershorts — to slide off. 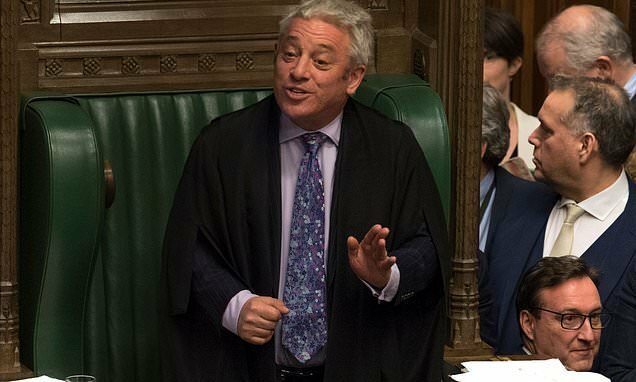 The man can be seen desperately trying to protect his modesty as he holds on to the board with one hand, while thrusting the other hand beneath him to hold on to his underwear, which has slipped down enough to reveal a very obvious tan line. 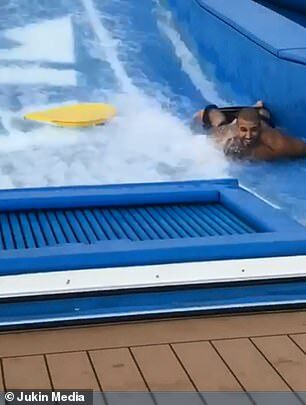 Eventually, he lets go of the board and slides to the bottom of the ride. By then, his shorts are around his ankles. 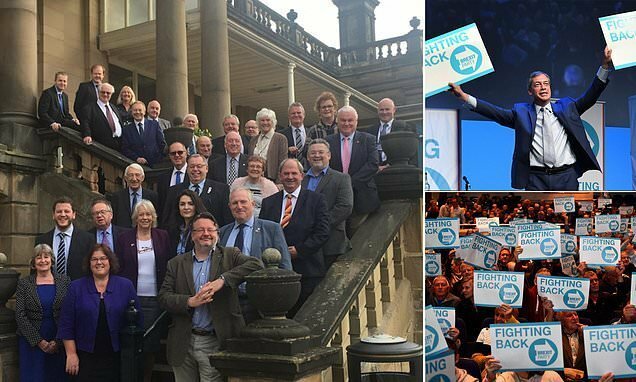 ‘Well done,’ someone in the crowd calls out, amidst cheers and laughter. 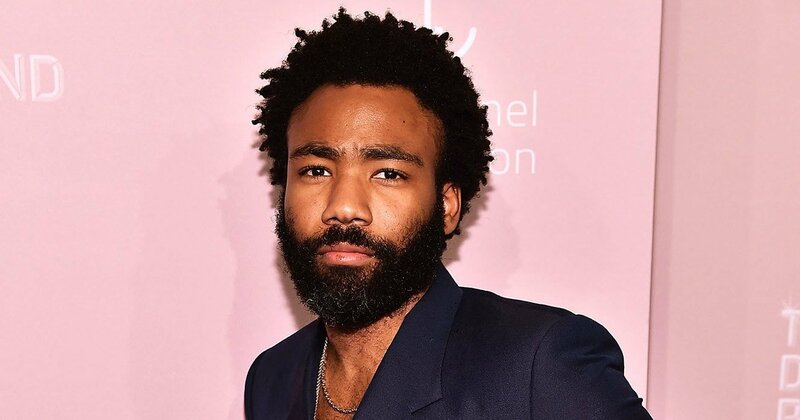 The man then stands up, yanks his shorts back into place and then climbs up to the top of the ride to talk to the amused ride operator, gesturing at his shorts while people in the background continue laughing.